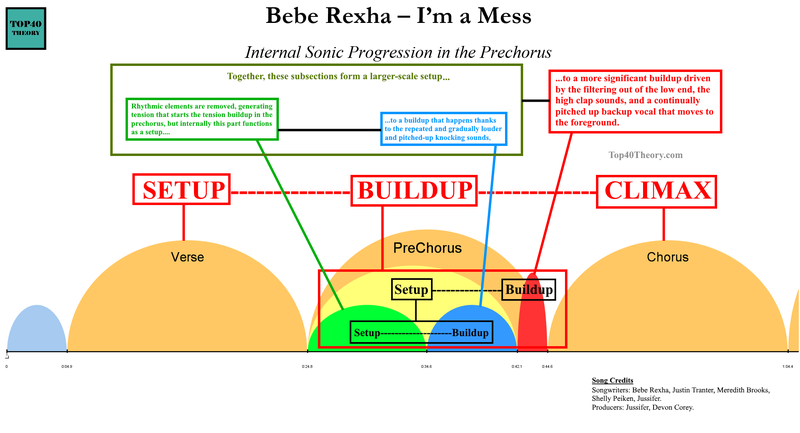 One of the biggest mistakes aspiring producers make is treating the song structure as a linear, section-to-section structure and ignoring its various dimensions. 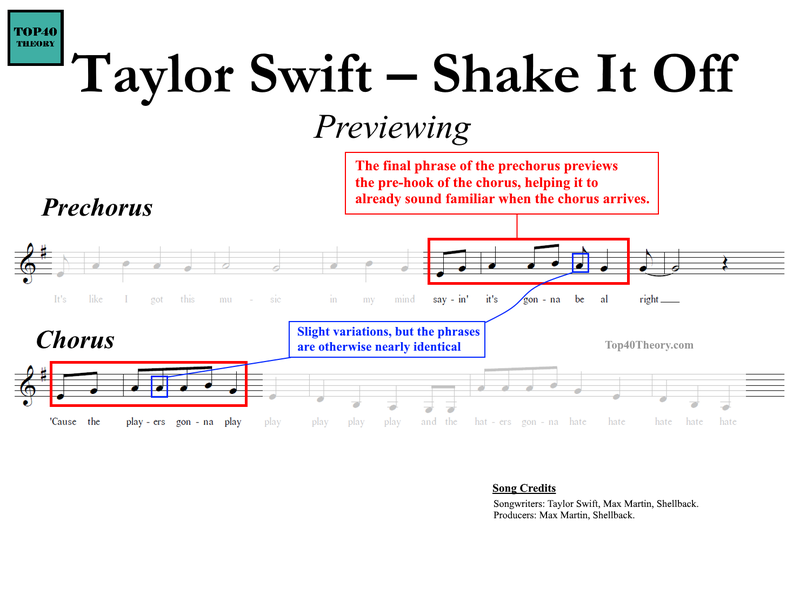 Being able to copy/paste sections is convenient, but it's important to understand the large-scale sonic arc of a song and allow each section to have a unique role within the bigger picture. The image shows a 'typical' large-scale sonic progression in a pop song. There are other ways to create a compelling structure, but the important thing is to do it with purpose and be aware of how the details affect the song as a whole. 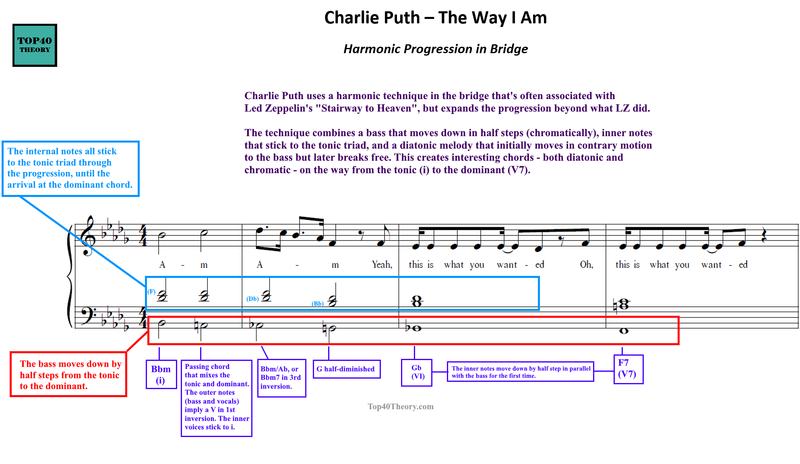 ​In the bridge of "The Way I Am", Charlie Puth creates interesting chords by using the 'Stairway Technique', which combines a bass moving down by half steps, inner notes that stick to the tonic triad, and a melody that first moves in contrary motion to the bass but later breaks free. ​Top40 Theory provides advanced music theory and composition knowledge, as well as consulting/coaching services, to pop songwriters and producers. You can follow Top40 Theory’s Twitter,Instagram, and Facebook page, as well as join the mailing list via the form located in the sidebar, to receive updates about new posts and other pop music theory related musings. You can also join the growing community of highly accomplished songwriters, producers, theorists, and composers at the Top40 Theory Facebook group. The prechorus in Panic! at the Disco's "High Hopes" sounds super dreamy, in large part thanks to the second chord of the progression. 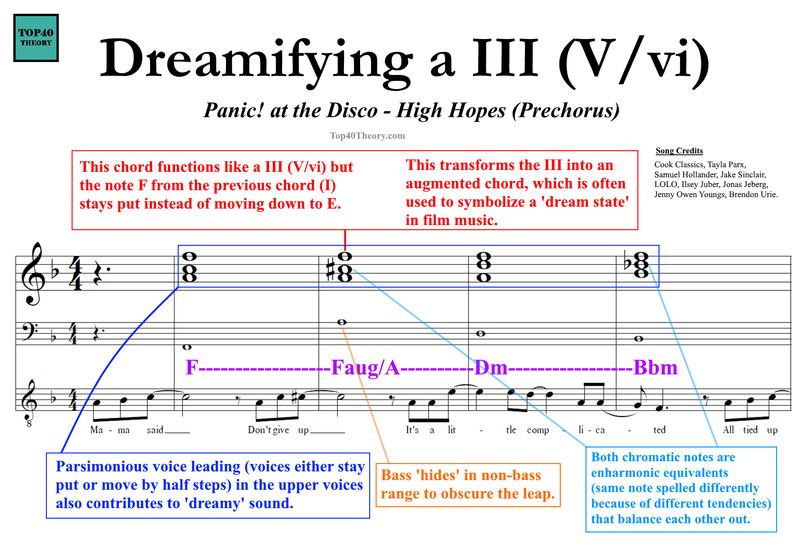 This chord functions and resolves like a majorized III (or V/vi) but one altered note turns it into an augmented chord, which is frequently used in film music to symbolize a dream state due to its internal symmetry and blurred tonal tendencies. 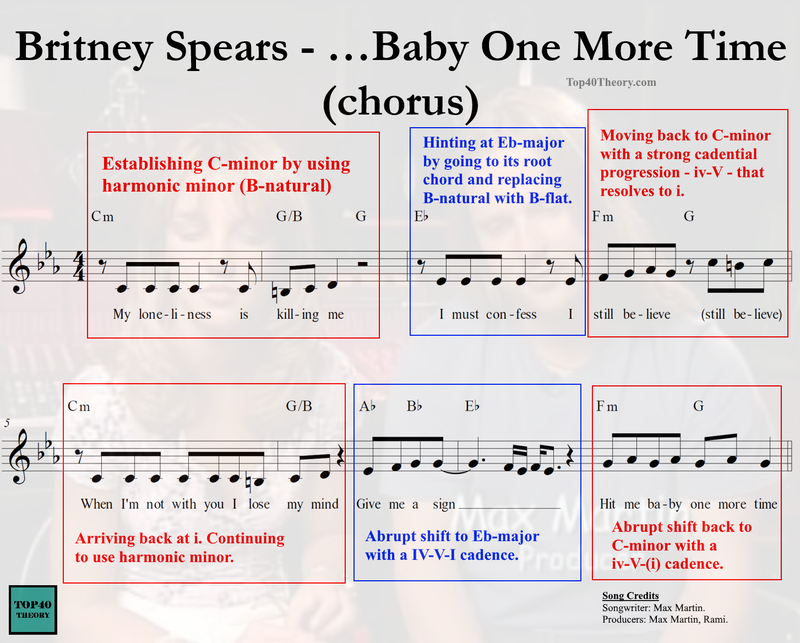 Britney Spears's "... Baby One More Time" was released almost exactly 20 years ago! 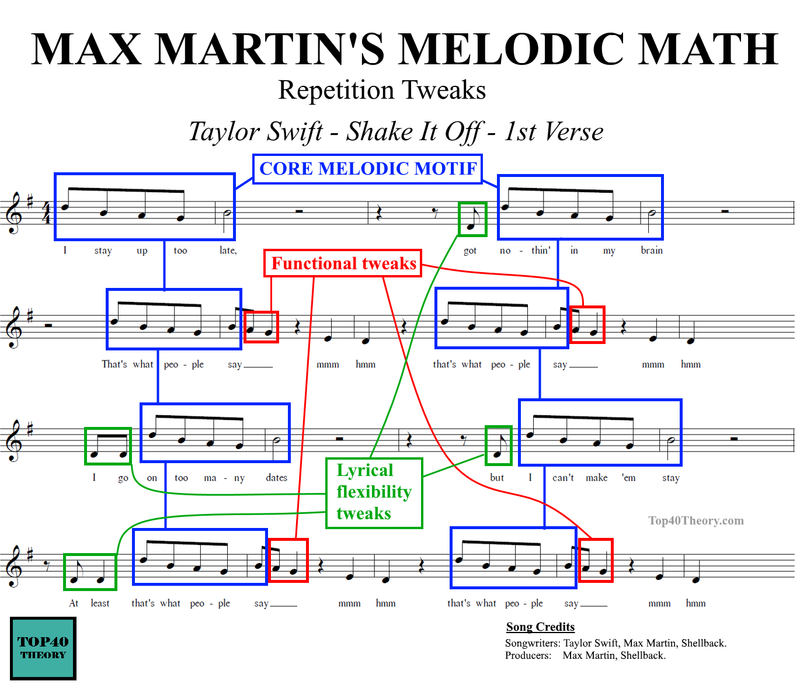 Back then, before Max Martin decided to shun harmonic minor and blur the distinction between relative major and minor keys, he would routinely move between them, temporarily establishing different tonal centers. Song structure is not simply linear. It has different dimensions (songwriting - topline and harmony, and production - sonic density and energy). It also works on different structural levels. Internally, sections are usually shaped by the melody. The large scale form is mostly expressed through the sound production. 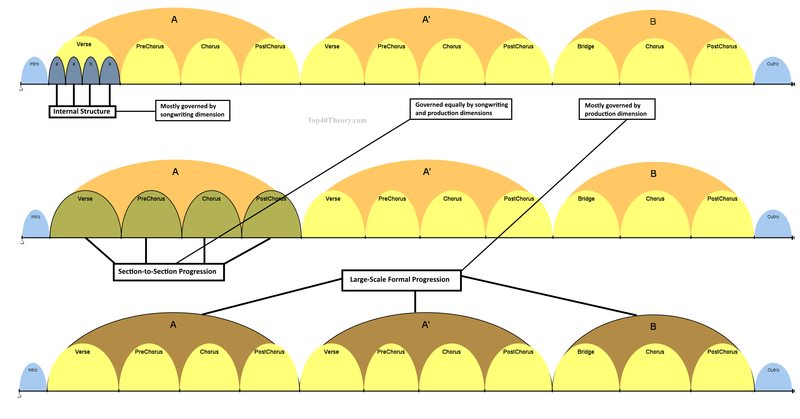 Section to section progression relies equally on both. Of course, not every song had to work like this but it's generally better to think of the various dimensions of a song rather than to think of it as a straight line. Songs that aren't developed on different levels usually sound too 'flat' unless they have something else going on that's amazing. 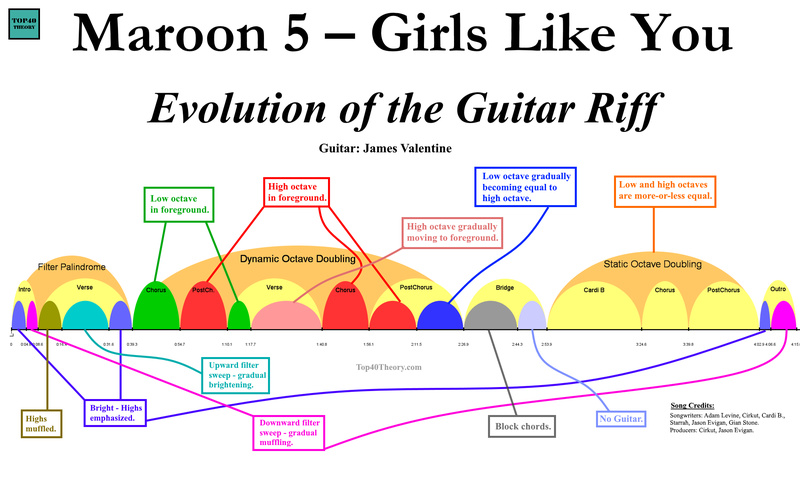 99.9% of the people who have listened to Maroon 5's "Girls Like You" (2018) most likely did not notice this, but James Valentine's guitar riff is way more than just a repetitive background loop. It evolves and changes throughout the song via creative filtering, octave doubling, and level balancing.